SAY/MIRROR (The Operating System, 2015) with her WWBPS family on 2.28.15! 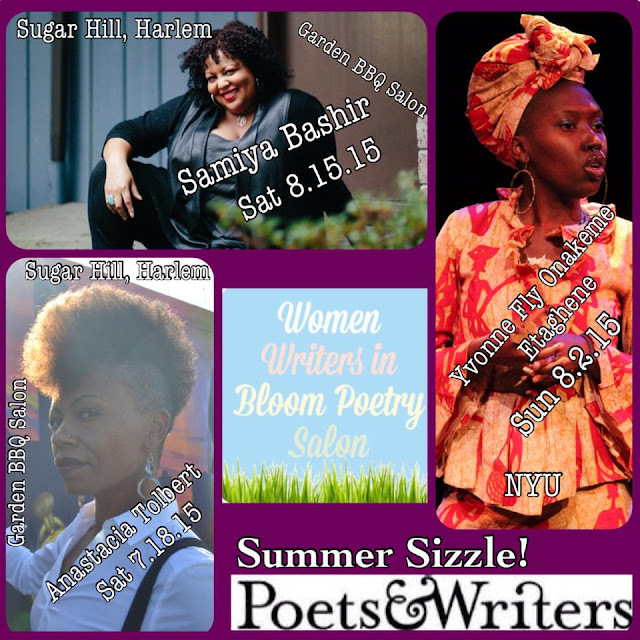 Upcoming Brooklyn-based BAC Funded 2015 Salon Features! Rachel Eliza Griffiths ~ 4.19.15 ~ 4 Year Anniversary Celebration! Keisha-Gaye Anderson features on 1.24.15! CLICK http://eepurl.com/lNK0b TO SIGN UP FOR INVITES! facilitates our very first CALIFORNIA-based Salon!!! The University of California at Berkeley! Open to All Genres of the VONA Community! 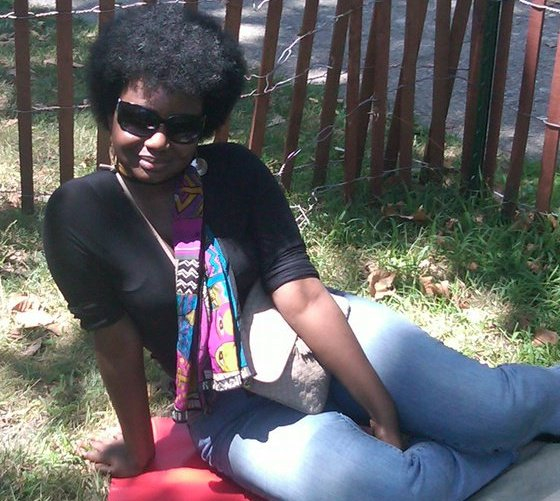 Dynamic poet Venus Thrash visits us from the D.C. area! 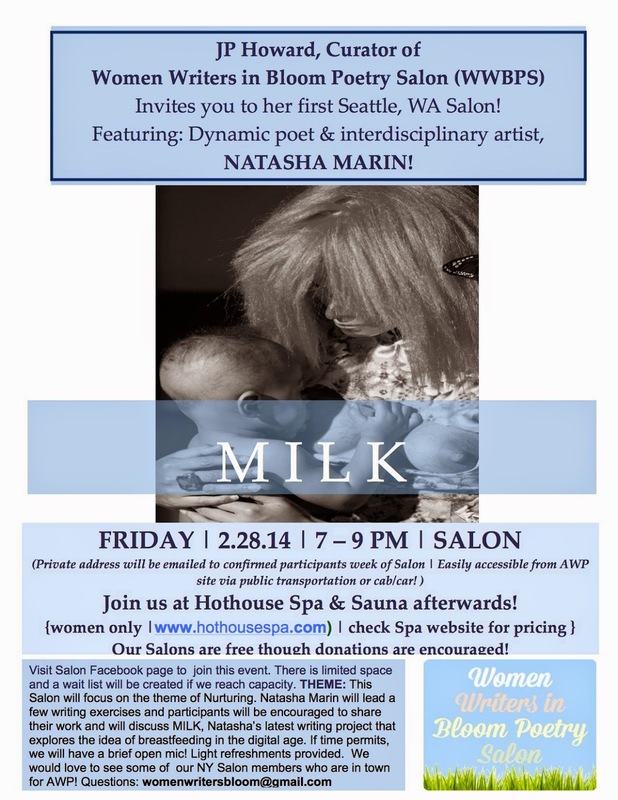 Dynamic poet and interdisciplinary artist Natasha Marin is our featured guest poet for our February 2014 AWP off-site Seattle based Women Writers in Bloom Poetry Salon! Natasha will facilitate a brief interactive workshop and discussion with the theme of Nurturing. 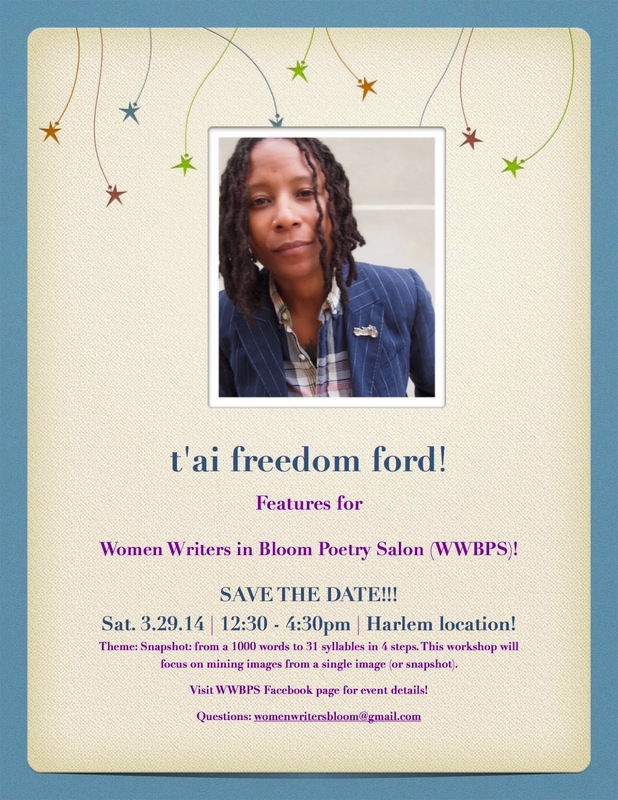 Multi-talented poet and author, Antoinette Brim is our featured guest poet for our NY-based February 2014 Salon on 2.22.14! 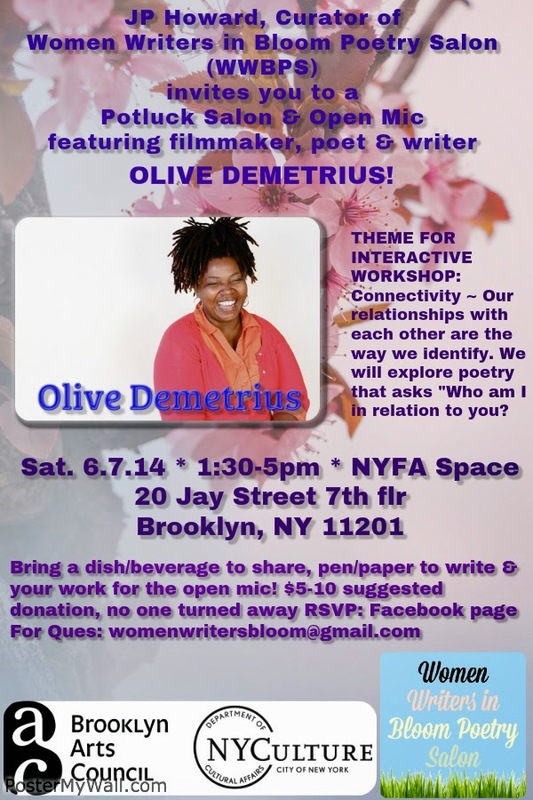 Antoinette will facilitate an interactive workshop and discussion with the theme of "When Poems Become Mirrors." UPCOMING 2013 POTLUCK SALONS & OPEN MIC'S! SAVE THE DATES! SAT. 10.26.13 | CHERYL BOYCE-TAYLOR! SAT. 11.16.13 | DOROTHY RANDALL GRAY! SAT. 12.7.13 | JEWELLE GOMEZ! SUN. 12.8.13 | KAMILAH AISHA MOON! October 26, 2013 Salon Filled to Capacity! Only accepting names for wait list. 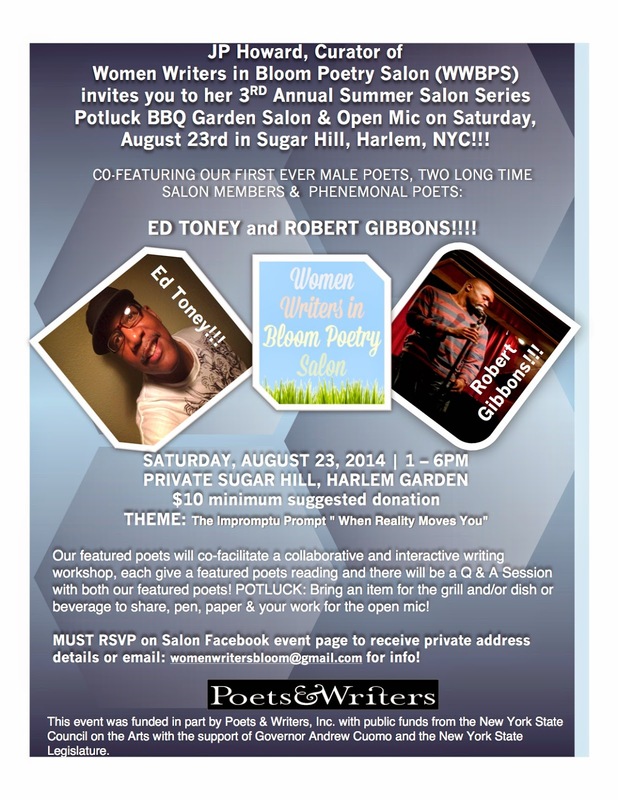 POTLUCK SALONS & OPEN MIC's! 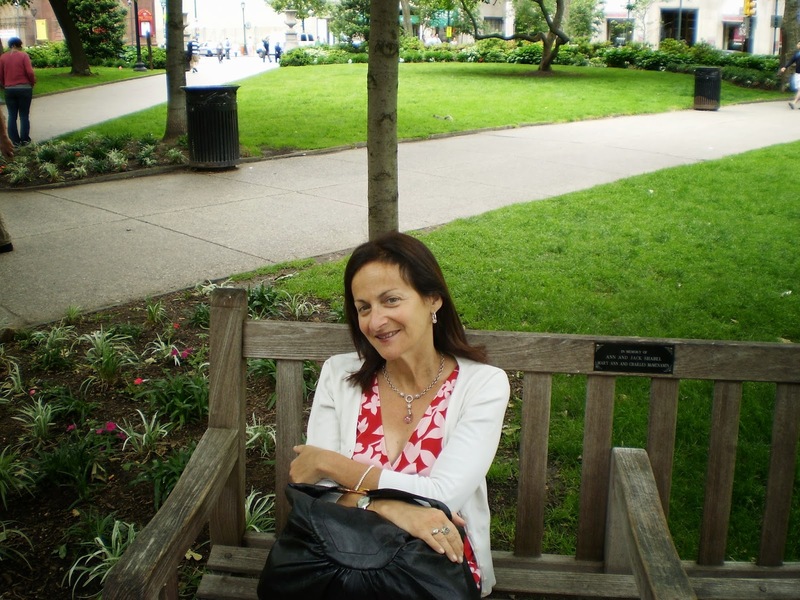 SEPTEMBER 2013 | PAMELA L. LASKIN! MULTI-TALENTED POET PAMELA L. LASKIN FACILITATED OUR SEPTEMBER 2013 SALON! PAM'S THEME was: GRIEF & GROWTH! AUGUST 2013 | CHERYL CLARKE! JULY 2013 | QIANA TOWNS! JUNE 2013 | HEATHER ARCHIBALD! DYNAMIC POET HEATHER ARCHIBALD FACILITATED OUR FABULOUS GARDEN JUNE 15, 2013 SALON! HEATHER'S THEME WAS: Sticking to the story: Exploring narrative in the form of the Haibun. Heather will facilitate an interactive workshop on the Haibun literary form, where participants will have the opportunity to blend prose and poetry. 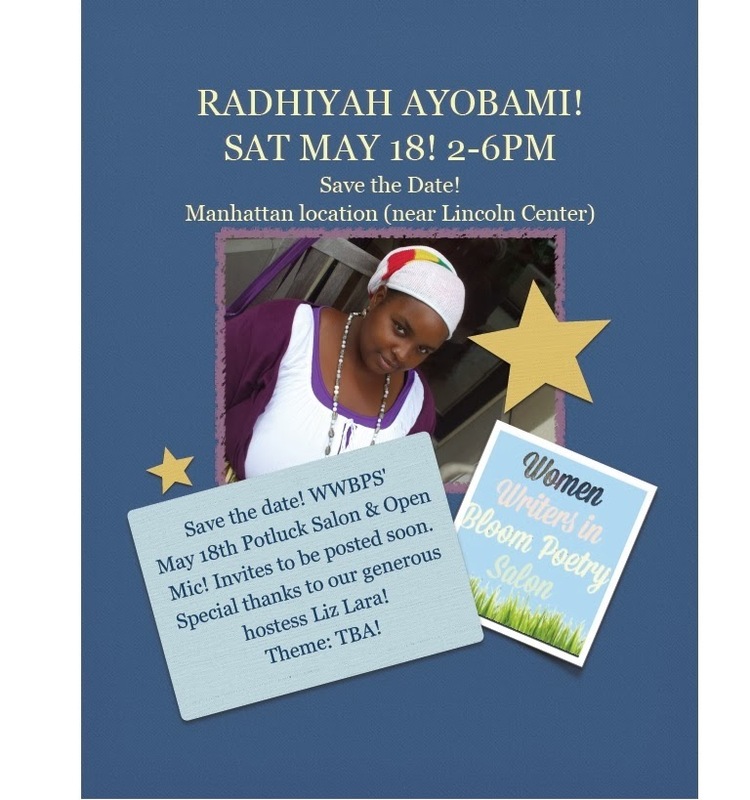 MAY 2013 | RADHIYAH AYOBAMI! 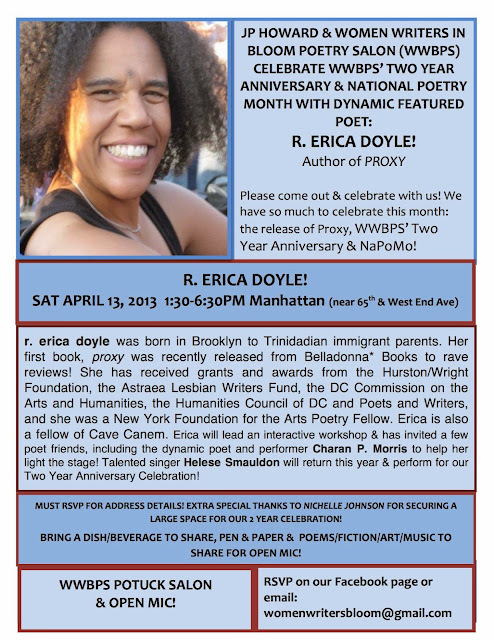 SAT APRIL 13th | 1:30-6:30pm | R. ERICA DOYLE & WWBPS TWO YEAR ANNIVERSARY CELEBRATION! 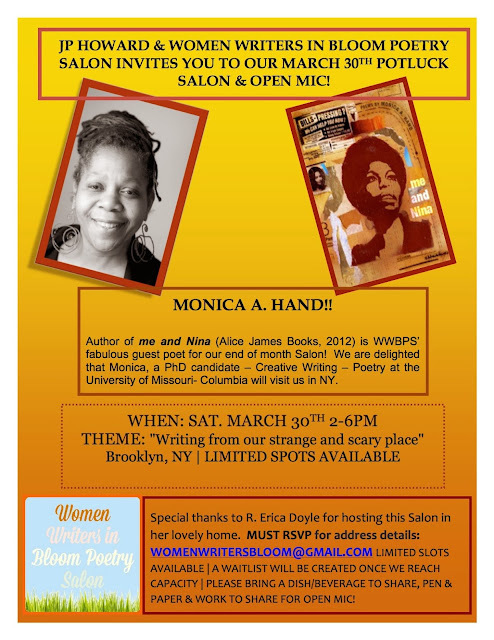 SAT MARCH 30th | 2-6pm | MONICA HAND! 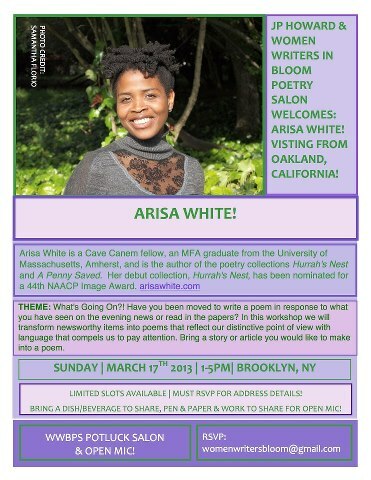 SUN MARCH 17th | 1-5pm | ARISA WHITE! APRIL 2013 | r. erica doyle! MARCH 30, 2013 | MONICA HAND! MARCH 17, 2013 | ARISA WHITE! 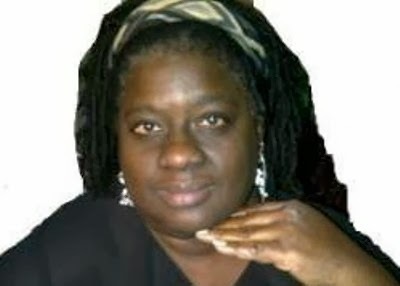 SUN * MARCH 17, 2013 * ARISA WHITE - Guest Poet Visiting us from Oakland, California! 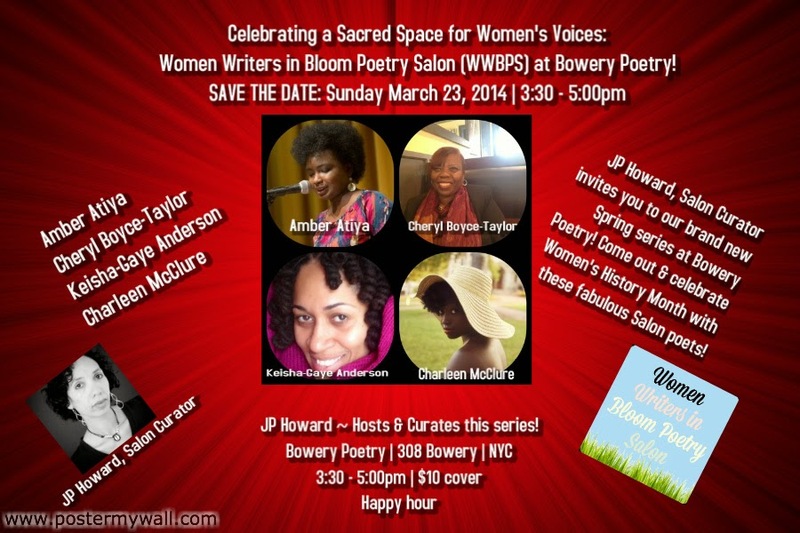 OUR SUN 3/17/13 SALON IS NOW FILLED TO CAPACITY! WE ARE ONLY ACCEPTING NAMES FOR OUR WAITLIST! 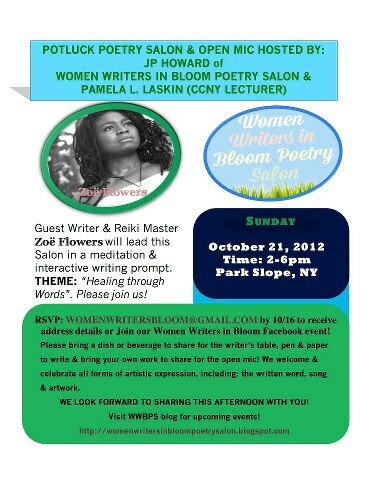 EMAIL: WOMENWRITERSBLOOM@GMAIL.COM TO BE ADDED! 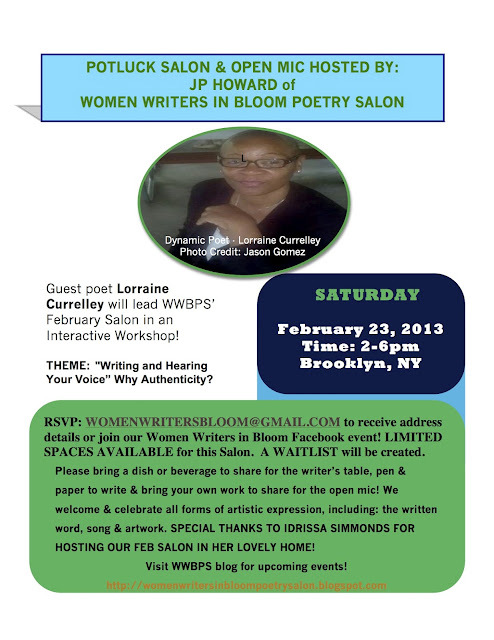 Sat * Feb 23, 2013 * Lorraine Currelley - Guest Poet! 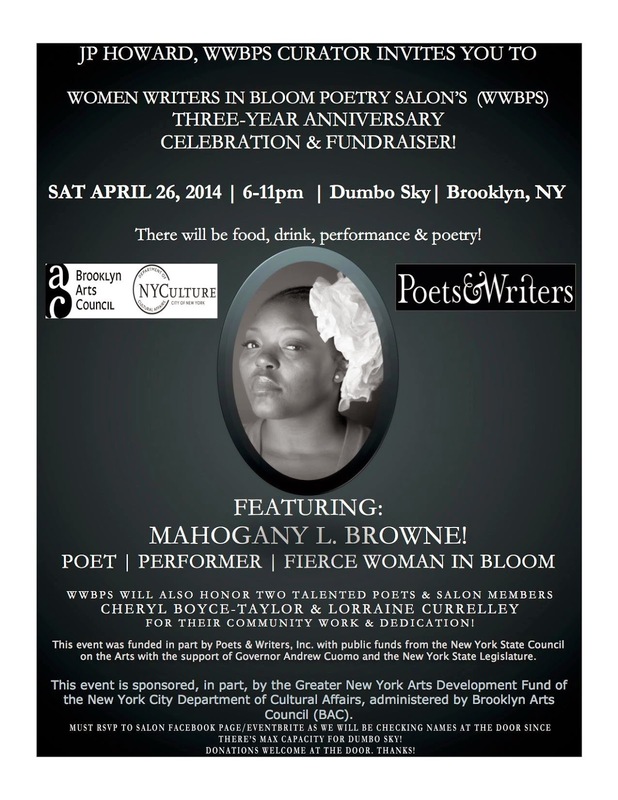 EMAIL: WOMENWRITERSBLOOM@GMAIL.COM TO RECEIVE ADDRESS DETAILS! LIMITED SPACE AVAILABLE - WAITLIST WILL BE CREATED! 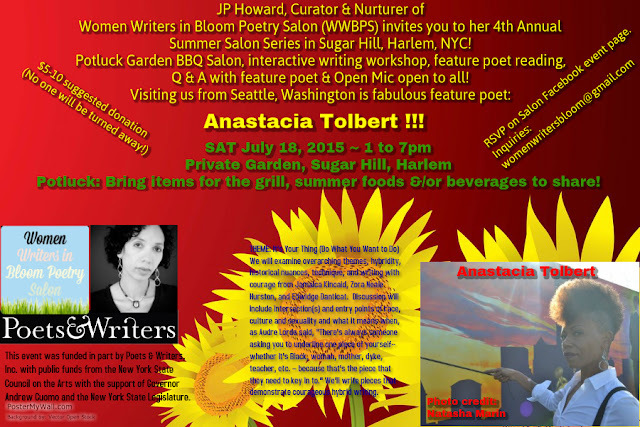 Click HERE to download Event Flyer! Click HERE for poet BIO! Sat. 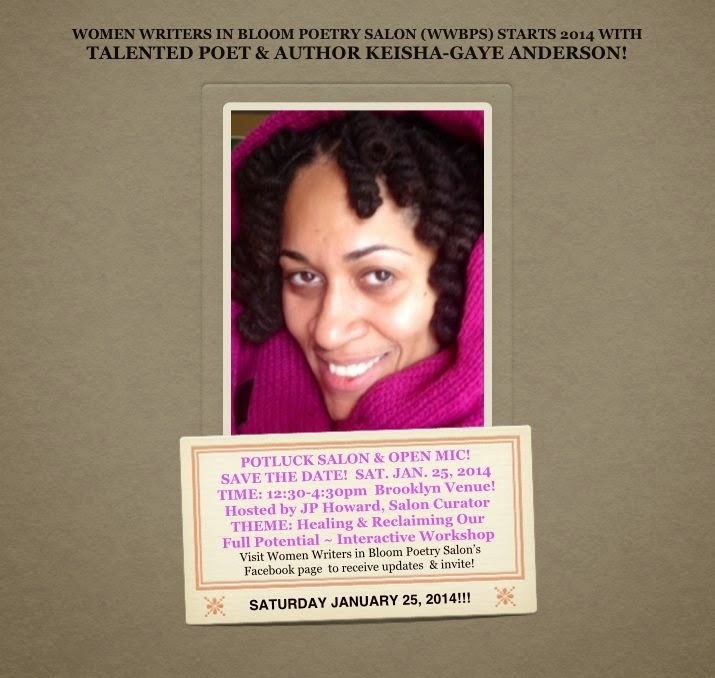 Jan. 26, 2013 * Kankia A. Wright-Guest Poet! THIS EVENT IS NOW FILLED TO CAPACITY! WE ARE ONLY ACCEPTING NAMES FOR OUR WAITLIST! Jacqueline Johnson, Author of "A Gathering of Mother Tongues" guest poet! 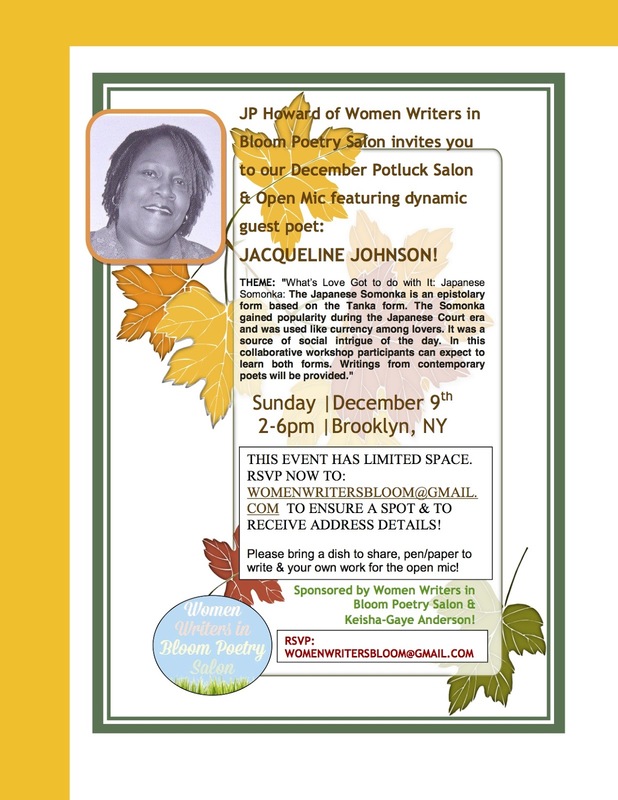 Jacqueline Johnson, dynamic poet, fiction writer & fiber artist leads this interactive Pot-Luck Salon & Open Mic. Theme: TBA. Bring a dish/beverage to share, pen & pad to write & your work to share for the open mic! 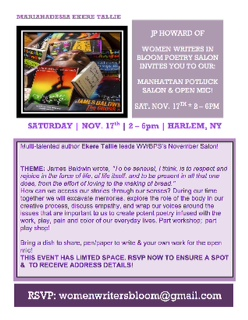 Must RSVP: womenwritersbloom@gmail.com by 12/01/12 to receive address details! 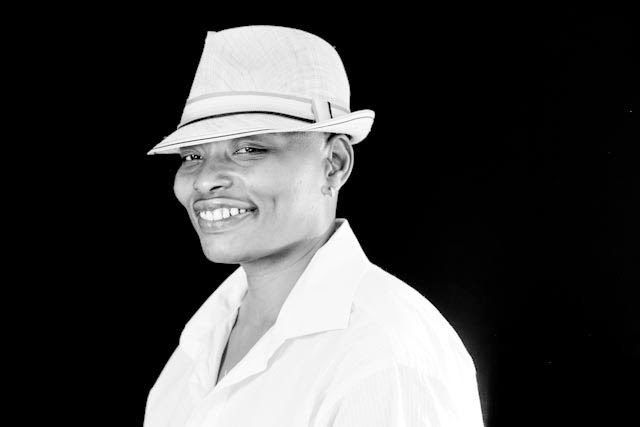 EKERE TALLIE, author of Karma's Footseps, guest poet! 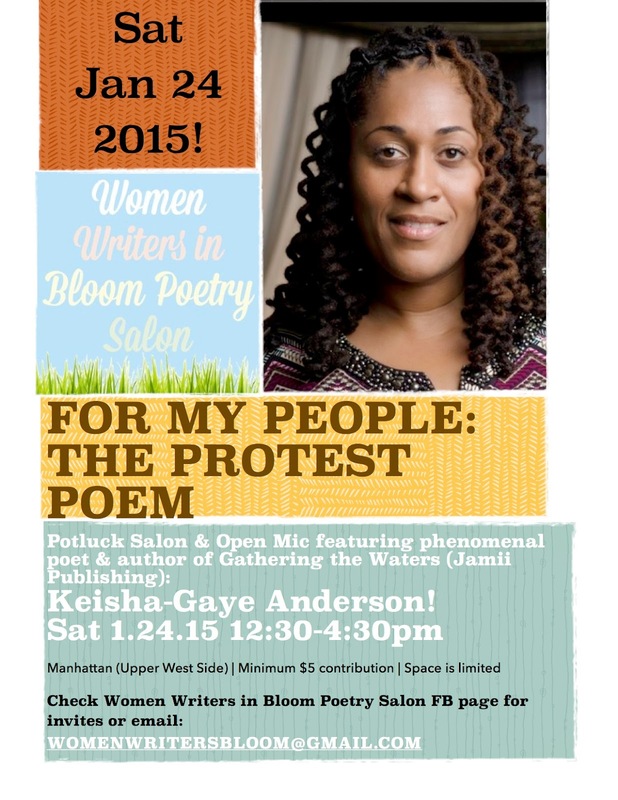 Talented poet, educator Mariahadessa Ekere Tallie leads this interactive Pot-Luck Salon & Open Mic. Click HERE to download event flier. THEME: James Baldwin wrote, "To be sensual, I think, is to respect and rejoice in the force of life, of life itself, and to be present in all that one does, from the effort of loving to the making of bread." How can we access our stories through our senses? During our time together we will excavate memories, explore the role of the body in our creative process, discuss empathy, and wrap our voices around the issues that are important to us to create potent poetry infused with the work, play, pain and color of our everyday lives. Those who have previously RSVP'd for this event will receive email updates with address location & reminders about one week before the event. 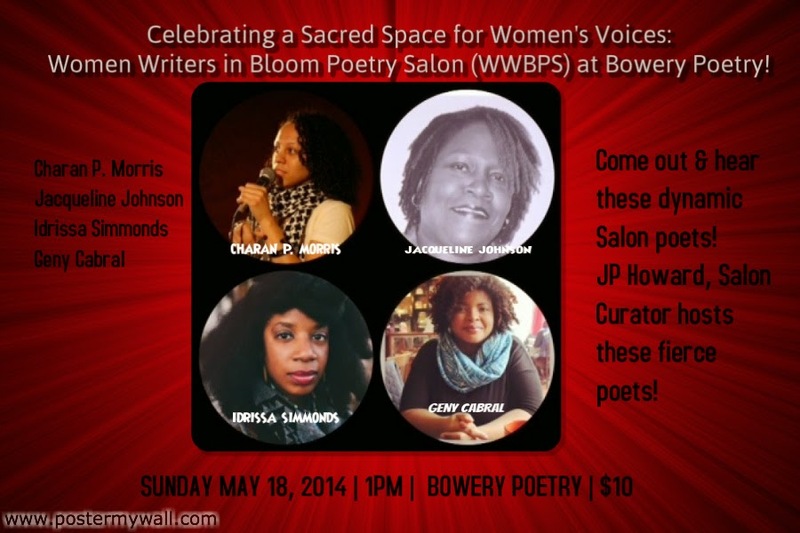 Talented poet & Reiki Master, Zoe Flowers, leads an interactive Potluck Salon & Open Mic. THEME: HEALING through Words. Ms. Flowers will lead us in a healing drumming, meditation & will facilitate participants in an impromptu writing exercise. Please join us for an afternoon of Healing! 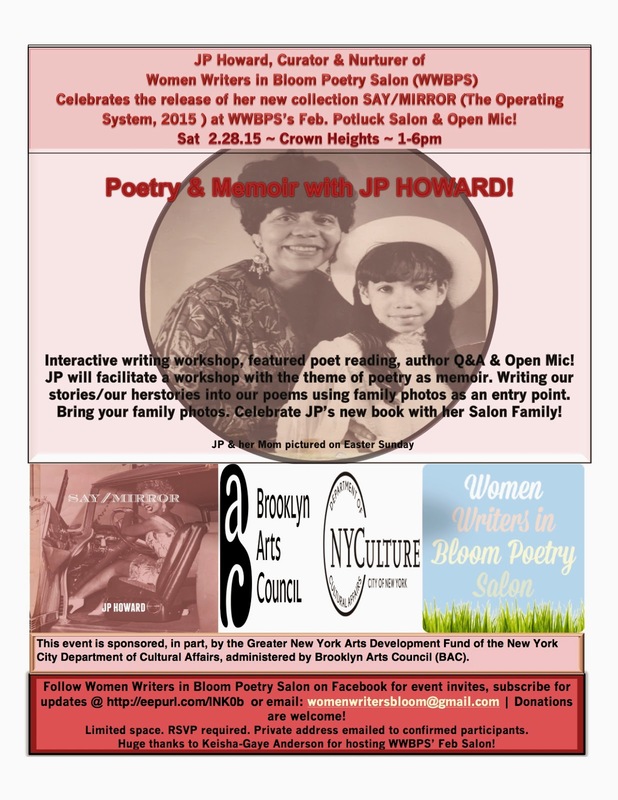 Hosted by: JP Howard of Women Writers in Bloom Poetry Salon & Pamela L. Laskin. 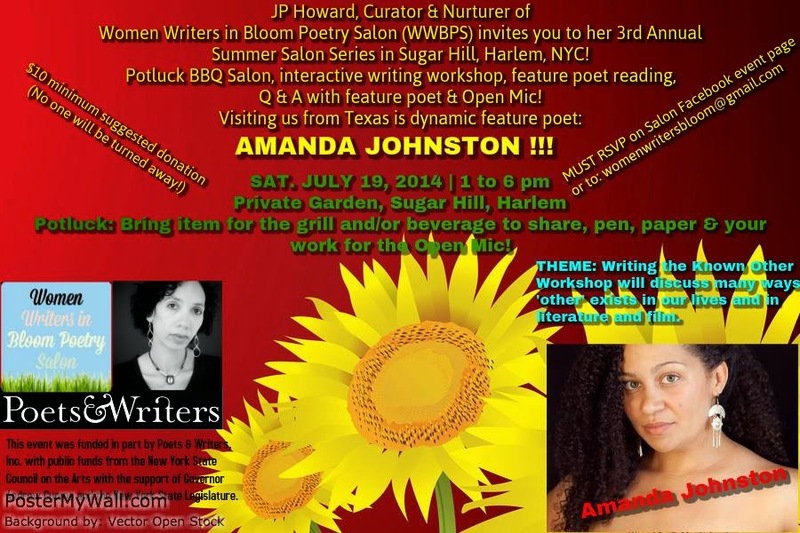 Bring a dish or beverage to share, pen & pad to write & your work to share for the open mic! We encourage & celebrate all types of artistic expressions for the open mic including: written/spoken word, song & artwork! 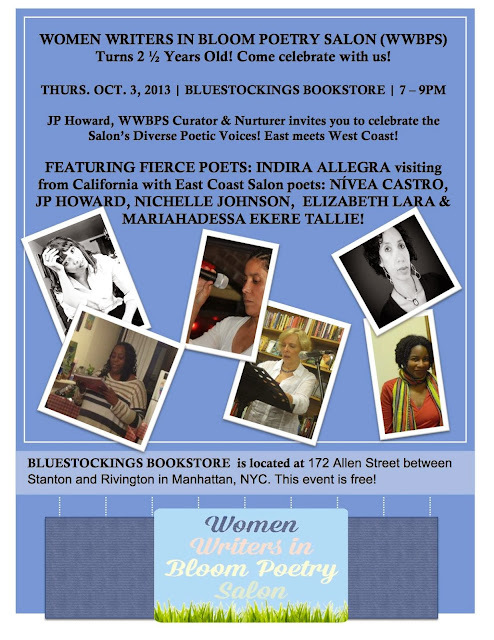 Must RSVP: womenwritersbloom@gmail.com by 10/16/12 to receive address details! 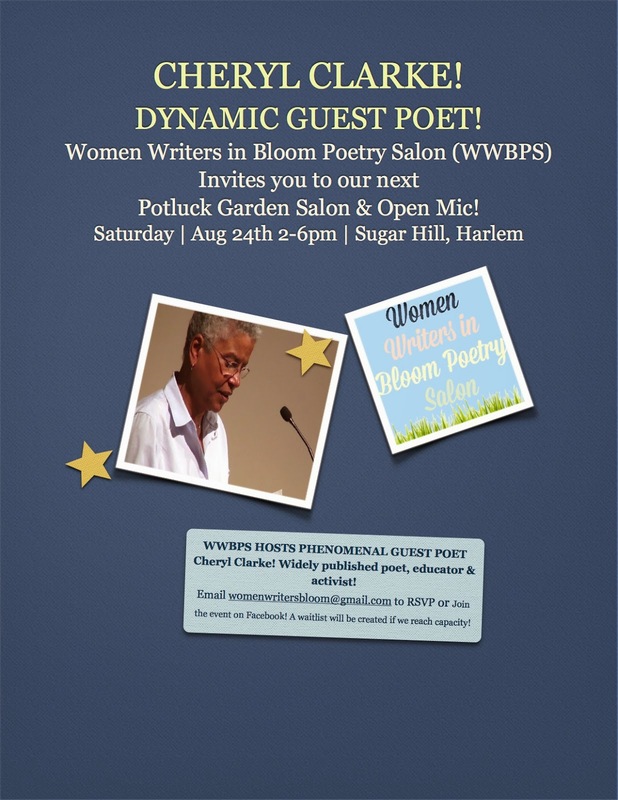 Pamela L. Laskin, CCNY Lecturer & WWBPS co-host "An Afternoon of Poetry!" Refreshments will be provided. No charge for this event. 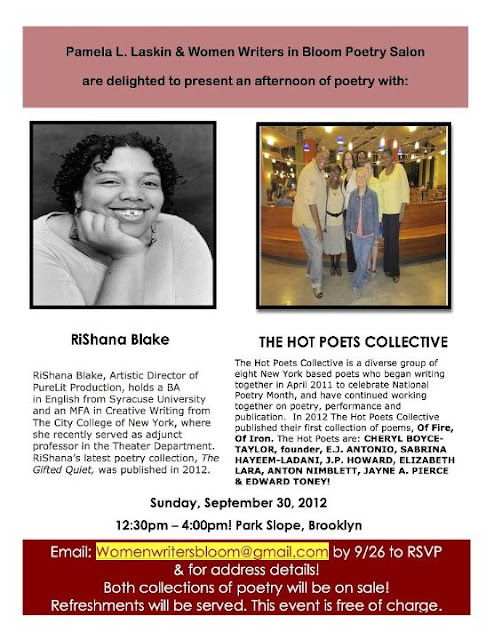 The Hot Poets Collective and Poet, RiShana Blake share poetry and will be selling their latest collections of poetry. 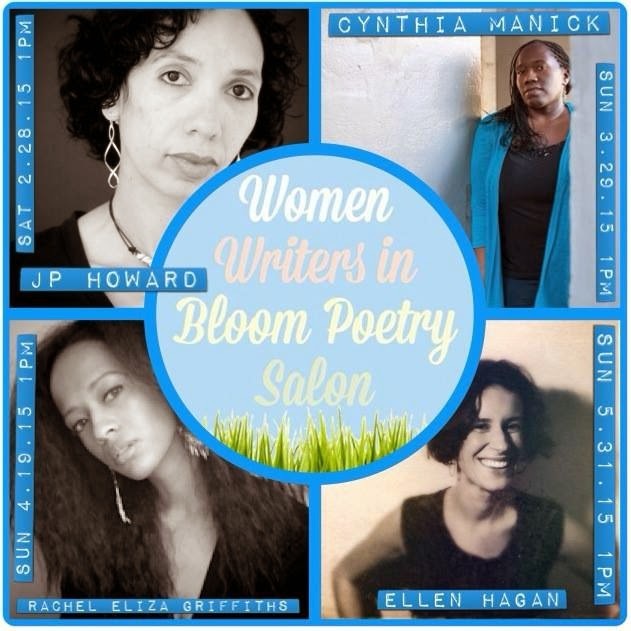 RSVP: womenwritersbloom@gmail.com no later than Thurs. 9/27 to receive Park Slope, NY address details. 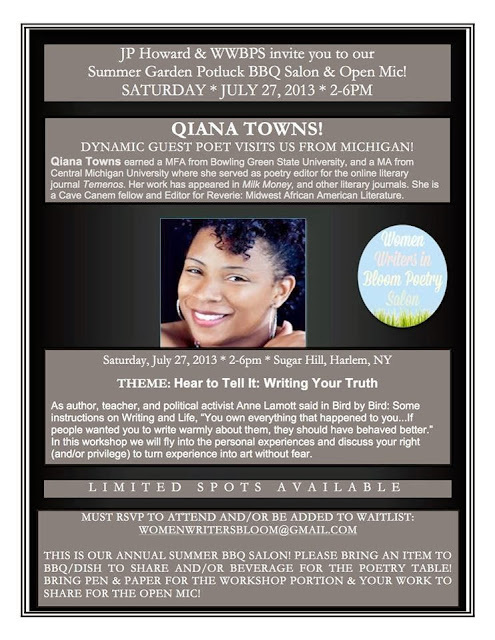 Dynamic poet, Amber Atiya lead the SEPT 23, 2012 Salon with an interactive & informal workshop. THEME: This Salon was inspired by "duende"or writing with pure and gut-wrenching emotion and honesty. Participants explored writing through fear/trauma and unearthed some secrets buried within during this Potluck Salon & Open Mic. y scene brings an intense body of work that often speaks to the beauty and struggle of being Black, female, and queer. 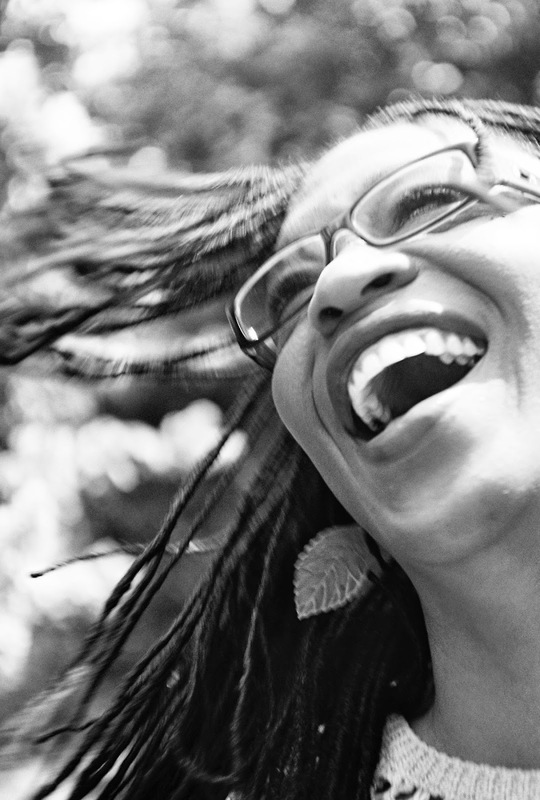 She has performed at theNuyorican Poets Cafe, Lehman College, Theater for the New City and elsewhere. Amber has been published in Tribes Magazine, Drunken Boat, and Coloring Book, an anthology of multicultural writers. 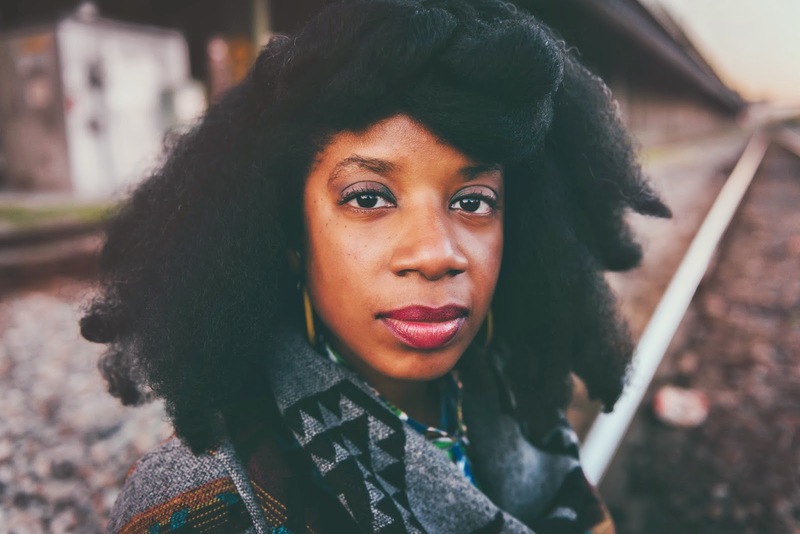 She is a participant in the 2012 Poets House Emerging Poets Residency Program and member of a writing group for women, currently celebrating its ten year anniversary. AMBER ATIYA - DYNAMIC POET! Oh! Wow! this is interesting! In my city also, there is something happening like this only in one of the Chicago event venues. I am going to attend this with all my girl-friends and I am sure we are going to have a great time there. Thanks for sharing this as well.